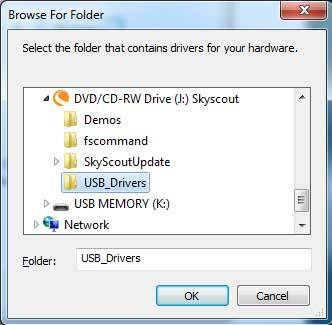 How do I install the SkyScout drivers and update software for my Windows 7 32-bit operating system? 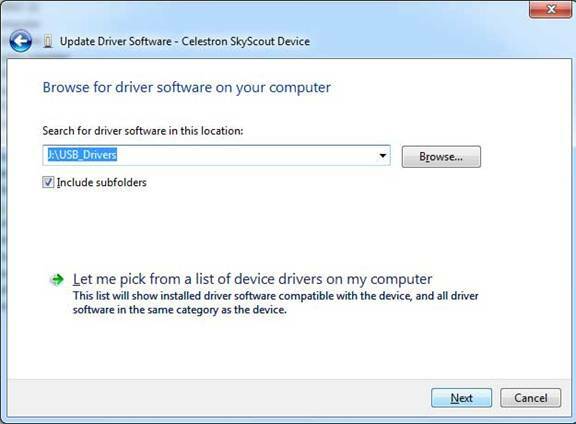 Note: Please read these instructions thoroughly before installing the SkyScout drivers and software. The appearance of your screens may differ from those seen here, but should be very similar. 1. 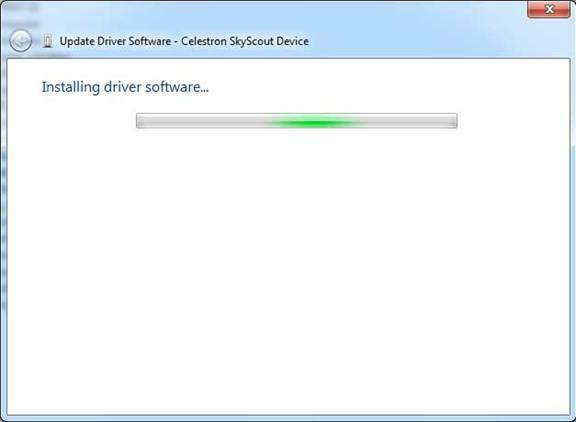 You will tell Windows where the SkyScout driver is and install it. Second, you will install the update software. Finally you will get SkyScout to connect with your PC. The actual firmware update procedure is covered elsewhere in the Knowledgebase. Plug in the USB cable to the SkyScout. Then plug the USB cable into your PC. 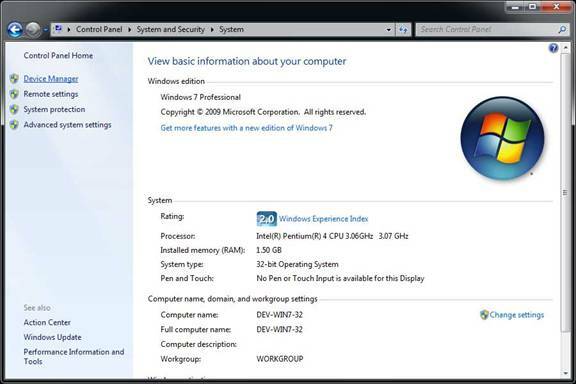 Click on Start – Computer – System Properties – Device Manager. 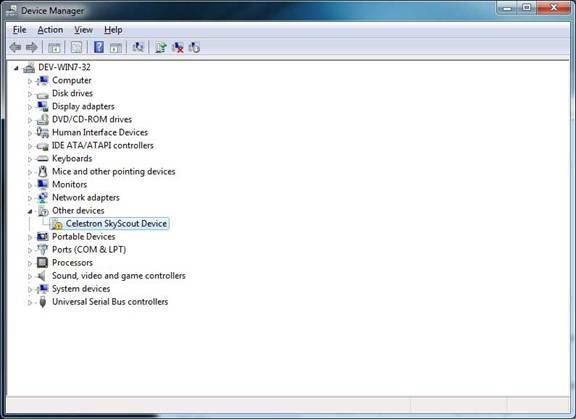 A list of devices connected to your computer will appear. Look under “Other devices”. 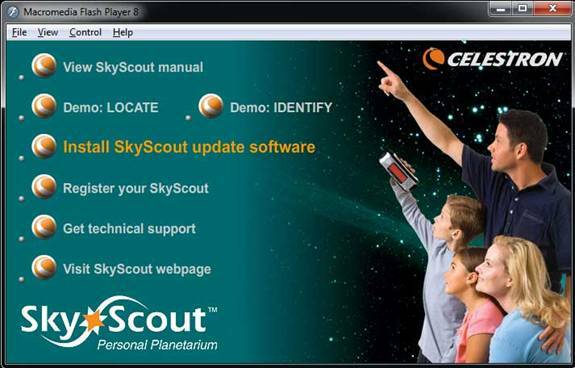 You will see “Celestron SkyScout Device” with a yellow alert symbol. 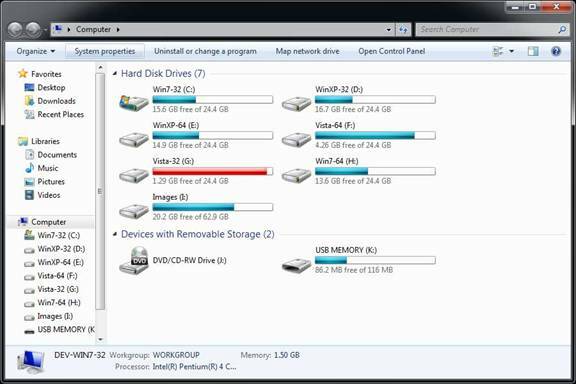 Minimize but don’t close the Device Manager window. Now insert the SkyScout CD. A window comes up with options to run a program or to browse for files. 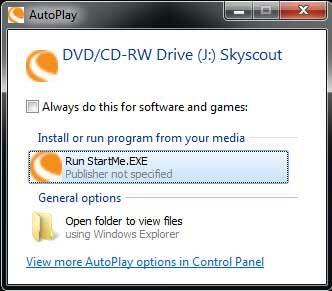 RunStartMe.EXE is automatically highlighted. Don’t choose either one just yet. Minimize but don’t close this window. Go back to the Device Manager window. 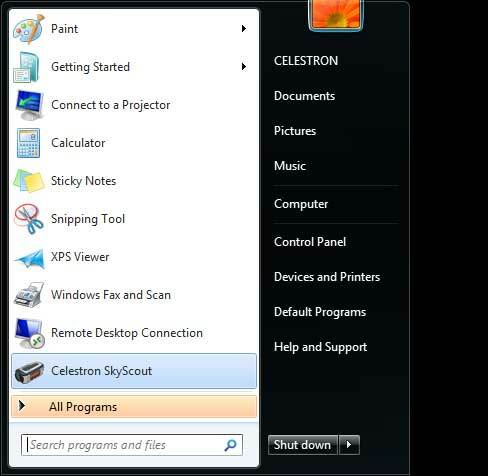 Right click on Celestron SkyScout Device. Select “Update Driver Software”. Now you will tell Windows 7 just where to find the drivers since it could not do it itself. Click on “Browse my computer for driver software”. Browse for the CD. 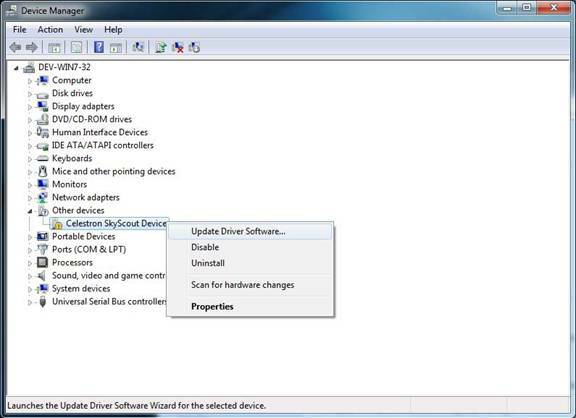 Click OK. Browse for the folder “USB Drivers.” Click OK.
You are now back at the Update Driver Software window. Verify that it shows the folder you just selected. Click Next. 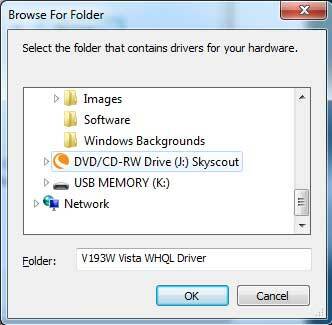 Now Windows will search this folder for the SkyScout drivers. 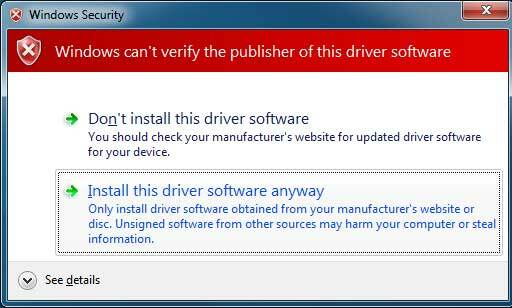 Next a warning window will appear, “Windows can’t verify the publisher of this driver." Click “Install this driver software anyway." The drivers will be installed. 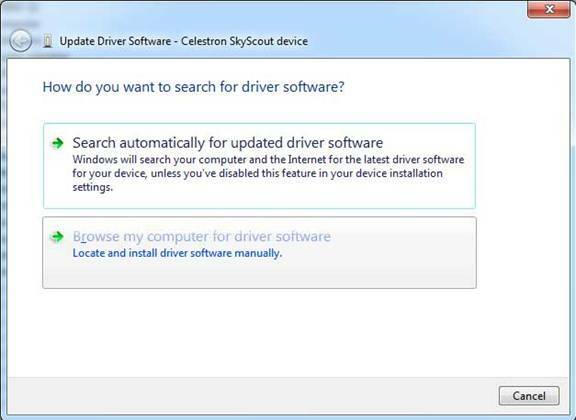 Finally a window will come up confirming that SkyScout drivers are installed on your PC. Click Close. The SkyScout splash menu comes up. 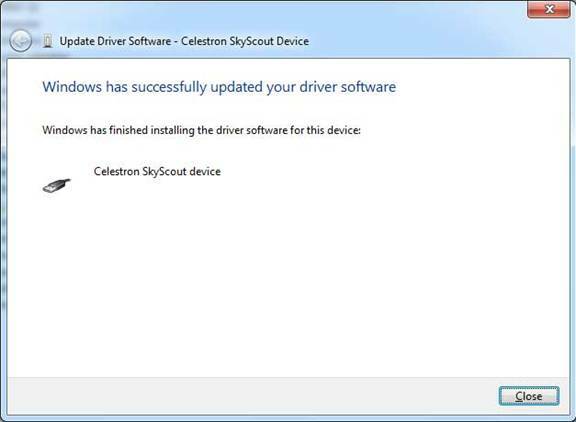 Click on “Install SkyScout update software,” When the message “Do you want to allow the following program to run?” Click Yes and follow the prompts, clicking Yes until you come to Finish. 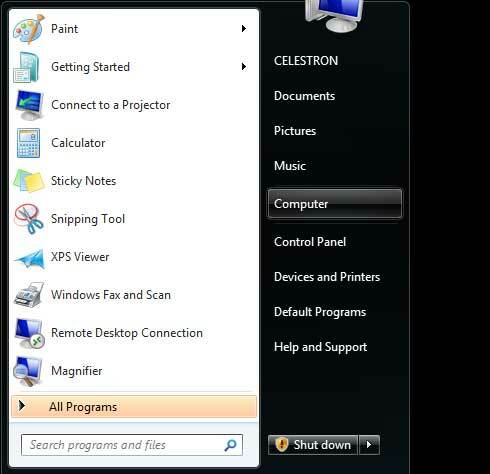 Confirm the installation by going to the Start menu and running the program. 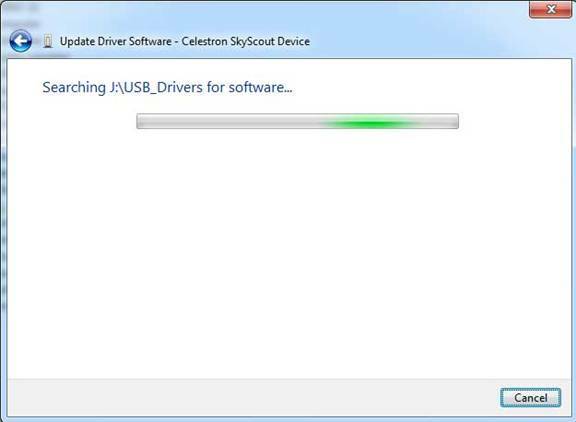 When the program comes up, it will say “SkyScout not connected” since the SkyScout has powered off while you were busy finding and installing the drivers and software. Windows will pop up a balloon “Looking for drivers.” The balloon’s message will change to ”Celestron SkyScout device installed, ready to use." Now your SkyScout is connected and ready to update.